After years of effort by the Save The Waves and the Huanchaco World Surfing Reserve, the Peruvian Navy has officially decreed that the coastline and surfing waves of Huanchaco are now legally and permanently protected federal law. The “Ley de Rompientes” – or Law of the Breakers, effectively protects Huanchaco’s waves and 4,000 year-old historic maritime culture. This milestone effectively permanently stops a series of jetties proposed for the town’s main beach, guaranteed by the Peruvian Navy’s enforcement. Signed into the federal legislation into law in 2013 by Peruvian president, Huanchaco is only the second coastal community in Peru to achieve this designation. Under the law, coastal communities must undertake a rigorous series of studies and formally apply to the government to enjoy the protections afforded. Approved coastlines are granted legal protections against any project that could otherwise alter their coastline and the way waves break. “This is a huge victory for the Huanchaco World Surfing Reserve and Save The Waves is very proud to be a part of this important milestone.” Said, Save The Waves’ Director of Programs, Nick Mucha, “Through the World Surfing Reserve program we have been able to secure legal and permanent protection for this historic coastline , ancient artisanal fishing culture and world’s oldest surf craft”. 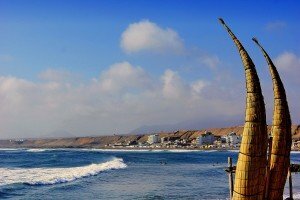 Huanchaco is widely considered to be the cradle of modern day surfing, with archeological evidence suggesting that local fishermen used their ‘caballito de totora’ reed fishing vessels as the world’s first surf-craft some 2,500 years ago and are still used daily by Huanchaco fishermen. Save The Waves would like to congratulate and thank our partners at Huanchaco World Surfing Reserve, Federación Deportiva Nacional de la Tabla (FENTA), Peruvian Navy, Waitt Foundation, and King Family Foundation for this important victory. Get more info on the Huanchaco WSR here. Check out the official Huanchaco WSR Facebook page here. We’re able to provide help to our worldwide partners because of our amazing supporters – become a member, join the coalition and help protect the places you love today.